New to Dance for PD? Want to try a class first? Buy a single class for only $10 and get your second class for FREE! Pay only $7 per class when you purchase a class card! Card will expire after 3 months after date of purchase. The Dance for PD program is built on one fundamental premise: professionally-trained dancers are movement experts whose knowledge is useful to people with PD. Dancers know all about stretching and strengthening muscles, and about balance and rhythm. Most importantly, dancers know how to use their thoughts, imagination, eyes, ears and touch to control their movements. This popular class is appropriate for anyone with PD, no matter how advanced. No dance experience is required. 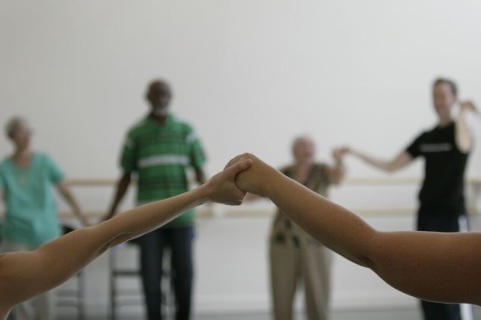 In chairs, at a bar or standing, participants explore elements of modern dance, ballet, tap, folk and social dancing, in a stimulating, enjoyable, non-pressured, social environment in which live music energizes, enriches and empowers. This method has been presented at the International Congress for Parkinson's disease (Berlin, 2005), the World Parkinson Congress (Washington, D.C., 2006), and the Society for Neuroscience (Washington, 2008). Articles about the class have appeared in Neurology Now, USA Today and The New York Times among other publications, and features about the class have been broadcast on NPR, PBS, CBS, and ABC. Classes modeled after Dance for PD now occur in more than 40 communities in the US, Canada, India, UK and Germany, and now Philadelphia! With two successful pilot classes in November 2010 and January 2011, Dance for PD launched in Philadelphia Spring 2011. 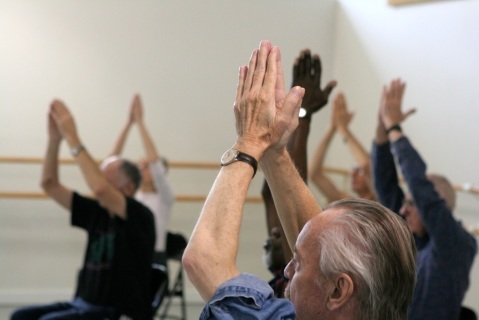 Presented locally by the Parkinson Council, Penn Medicine, and the 954 Dance Movement Collective, it all began about 11 years ago in Brooklyn as a unique collaboration between the Mark Morris Dance Group and the Brooklyn Parkinson Group, a chapter of the National Parkinson Foundation. Now the program stretches around the country and around the globe. David Leventhal, John Higginbottom and Olie Westheimer led the Philadelphia Dance for PD Teacher Training, gathering a group of amazing people committed to bringing the program to the Greater Philadelphia area. This class is made possibly by a generous donation from donor Karen Jacobson Milberg. Additional funding has been made possibly for the program at the 954 Dance Movement Collective by the Leeway Foundation and the Puffin Foundation. Contact Keila Cordova for more information about the program, the classes, the schedule or with any questions about Dance for PD at 215-627-1157 or 954dmc@gmail.com.